The Confidence Gap is being highlighted more and more as a reason as to why women may not be achieving all that they can in the workplace. Multiple studies have indicated that many women want leadership roles, but something is holding them back. That something has been shown to be confidence. In fact, "success, it turns out, correlates just as closely with confidence as it does with competence." Being a woman, in the tech industry, and running my own business, the stories that are told are indeed relatable, and unfortunately, all too common. I've long seen confidence as an important tool in the arsenal against workplace assumptions and bias, alongside both knowledge and understanding. I believe that everybody should be encouraged to go after what they want, and it is just such a shame when confidence is the thing that is stopping people from going after their dreams. When we were approached to use our industry methodology, typically used to discover the success factors of an Experience, to define and evaluate confidence, I jumped at the chance to work on something so imperative to a cause that is fundamental to the future. Our aim was to help people better understand themselves and to support growth in an achievable way. Now, after a year and a half, I am very proud to say that we have helped numerous women, individuals, and teams learn the attributes of genuine confidence, and how they can develop their own levels of confidence in an actionable manner. Through our research, we discovered the relationship between 13 factors and over 70 attributes that contribute to genuine confidence. 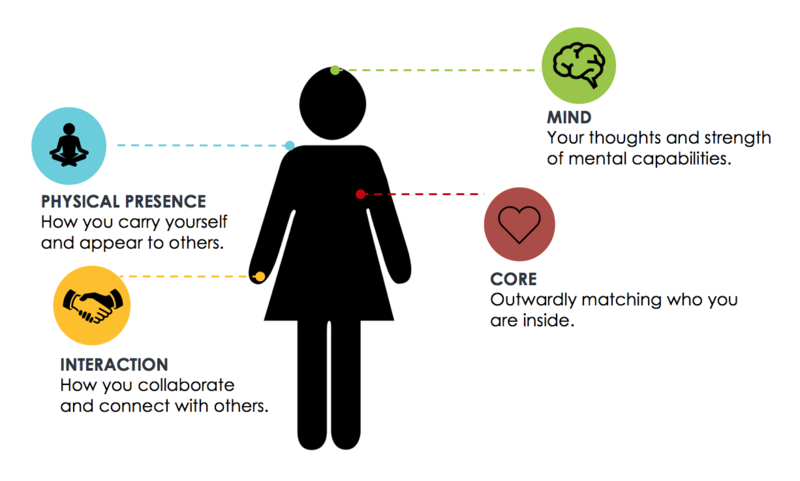 The evaluation we created was built to encourage reflection, and to look across all of these factors and attributes to provide insight into where you are on the scale of traits as it pertains to the characteristics commonly found in confident, successful, happy people. We then went on to look at how you can develop these different aspects further, to increase your own level of confidence. 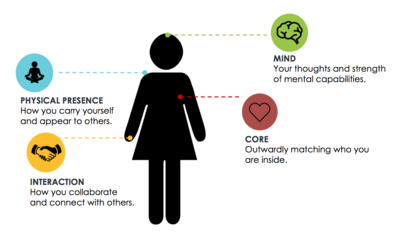 We found that confidence itself encompassed a holistic personal "confidence wellbeing," as well as behaviors that demonstrated these traits. Mind - Your thoughts and strength of mental capabilities. Physical Presence - How you carry yourself and appear to others. Interaction - How you collaborate and connect with others. Core - Outwardly matching who you are inside. The ability to clearly represent one's thoughts in a manner appropriate to one's audience. The ability to act and think in a way that does not demonstrate logical contradictions. The quality of being honest in both communications and actions. The ability to make decisions quickly and firmly. We found that it is not the case that you need to be 100% in each area; each individual's personal "mix" will pertain to their context in life and work. For example, some roles and situations may require higher strengths in the interaction dimension. Confidence is at the very core of people having the ability to grow and achieve happiness. When individuals have high levels of confidence they have the ability to be more creative, innovative and happier. This has large effects on the workplace and on an organization's competitive advantage as it creates better leaders, higher productivity, more motivated employees, happier teams and more. The key is in understanding what true confidence is and that it does not refer to those that are "overly confident", arrogant or "big-headed". Truly confident people are indeed open to feedback, understand that helping others to succeed does not affect their own success, are willing to take chances and are able to adapt to changing environments. When you display traits associated with this authentic confidence, it can bring better connections with others, higher levels of trust, and greater respect. Growing greater levels of genuine confidence can also help women to embrace challenges, be prepared for and to take risks, as well as to drive them to believe in themselves more. It enables them to be their best selves. Another gap exists between the things that students learn and what they actually need in order to successfully navigate the complex environments they find themselves in. A big part of enabling women, growing confidence, and closing the gap, begins with starting the development of various attributes earlier on so that young women will already have these skills in their toolbox as they enter the world of work. While it is bad news that findings show that the Confidence Gap is, unfortunately, something that exists around the world, even that the gap is actually growing in more developed countries, there is indeed hope. It is possible to increase your level of confidence. This is certainly not an overnight achievement - it takes conscious effort and understanding to change patterns of thought and behaviors. However, the journey can start with just gaining a true understanding of your individual opportunities and strengths. As Helene Lerner told the Business News Daily; "Just knowing what drains your confidence is a big step forward." Our own learnings and feedback to date also support the premise that confidence can be acquired. This means that the Confidence Gap can, indeed, be closed with some understanding, committed actions and development. 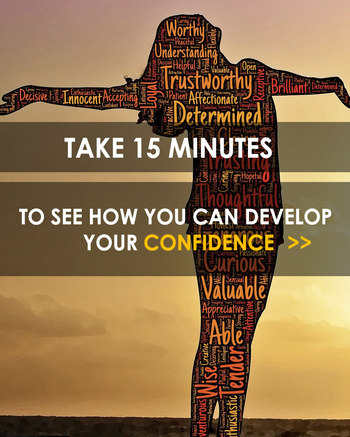 Learn more about developing confidence and the Confidence Index here.